A long, long time ago I was at the great Canfield Fair in Canfield, Ohio with my aunt and uncle. I may have been five or six or seven but I was probably five. I recall coming up victorious in one of the many carney games over there, yes that is right, I was single handily winning carny games at age five. WELL, anyways, for a prize I received a framed picture of the red dog off the Red Dog Beer label with "Red Dog Beer" in the background. 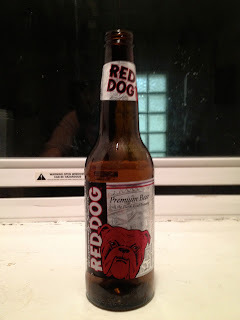 I decided right there that when I grew up I would drink Red Dog. Then I grew up. It took me too long to find this beer. Butala kind of sent me on an assignment back in May to review this stuff and I wanted it to be my return to the review game. I went up and down the Pennsylvania-Ohio border, to every state store with barred windows and fat dudes behind the counter, but no Red Dog to be found. I gave up until I moved back to my home away from home; Happy Valley, State College, Pennsylvania. So, onto the beer I guess. At first sip I was definitely surprised at flavor of this beer. Instead of tasting like absolute garbage it actually didn't taste much like anything at all, but I liked it. I knew right then that I found a new party beer. "Uncommonly Smooth" is printed across the label and they weren't lyin'. This beer goes down like water for something recording at 5% on the ABV scale. The initial watery flavor is followed up with a random hoppy bitter taste. It's a bonging beer, if you're into that. I picked up a twelve pack at the local bottle shop for 10$. You do the math, stranger. It's cheaper than DIRT. So, if you're looking for a beer to get twisted off quickly, say at a tailgate or pre-gaming, this is the brew 4 u. This ain't a classy beer, except maybe at Michigan International Raceway. ha! fabulous. i can't remember the last time i had it, but i remember i was insulted which a quick feeling of excitement! Red Dog, a Miller product, is proof that advertising works.